Visit Chuck’s Southern Comforts Cafe. Treat yourself to some of the best eats in Chicago! If you haven’t been to Chuck’s Southern Comforts Cafe, you’re missing out on one of Chicago’s most inspired blend of Mexican, Cajun-Creole, good old southern cookin’ and the BEST s…l…o…w cooked smoked BBQ you’ve ever had! Be sure to check check out our full menu online as Chuck likes to let you know what specials he is cooking today so you can plan accordingly. 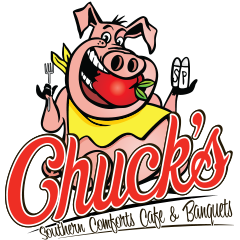 The Chuck’s Southern Comforts Cafe menu is organized by food, drinks, today’s specials and Chuck’s monthly specials. Whether you are looking for breakfast, lunch, dinner or even just a beer, Chuck’s is happy to serve you. We take reservations anytime for any occasion..call us at 708-229-8700.